BEETHOVEN AND JAZZ… I sense the classical purists cringing… and maybe the jazz purists squirming. Preconceived thoughts based on the dated ’70s pop-classic era of Waldo de los Rios and James Last, or Jacques Loussier’s fairly literal jazz trio interpretations of J S Bach, possibly spring to mind when such crossover projects are birthed. But double bassist Dieter Ilg and his colleagues approach their piano trio extemporisations on the incalculably revered works of Ludwig van Beethoven in a less conspicuous manner (having taken on both Wagner and Verdi in previous releases). Describing his 18thC German compatriot as “undoubtedly one of the great improvisers of Europe’s music history, approaching everything with passion, imagination and the will to create something new”, Ilg seeks to embody that spirit of invention in thirteen pieces for bass, piano (Rainer Böhm) and drums (Patrice Héral). Some selections are more familiar than others, but even the recognisable phrases of Pathétique and Moonlight sonatas break away from their moorings sufficiently to flow into new, undiscovered rivulets. In Ode, the life-affirming stature of the final movement of the 9th Symphony (famously the ‘Ode to Joy’) is translated into serene impressionism, Böhm’s lush piano chords painting steadfastness from a different viewpoint. There’s drama, too, as Sturm (Klaviersonate no. 17, op. 31) broods and then vigorously swirls to Böhm’s rapid runs, Ilg’s rasping bass and Héral’s drum solidity; and it’s entrancing to hear how the trio reinterpret the string quartet tension of the Grosse Fuge (op. 133) into a greatly improvised work, Fuge, which maintains reference to the master’s compositional characteristics. Illustrating clearly the intentions of this project, an audacious adaptation of the Arietta from final Piano Sonata no. 32 (op. 111) takes its usual solemnity off into unpredictable territory; Böhm’s deft chromaticism here rolls freely over the turbulence of bass and drums – and whilst such a transformation may sound crass, it creates a perfectly plausible jazz trio number which respects its origins (in Dieter’s words – my Beethoven). Ilg’s bass technique is strong and supple, ranging from the bluesy pliancy displayed in 109 to his rapidity in the Allegro from the Pathétique sonata (this, a particularly demanding number which demonstrates the remarkable unity of these slick musicians). Listen again to Alfred Brendel, Daniel Barenboim or Paul Lewis (the majority of Ilg’s creations, here, are based on the piano sonatas) and it’s incomprehensible, of course, that the beauty and majesty of Beethoven’s sublime works could ever be surpassed. However, there’s fascination to be found in these perceptive piano trio reworkings – with or without comparison to the originals – which provide an absorbing and, at times, pleasingly disorientating sound world. 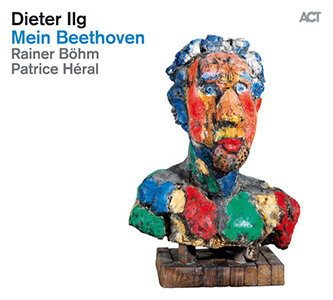 Released in the UK on 2 February 2015, further information on Mein Beethoven can be found at ACT Music.